Jabra Elite 65t true wireless earbuds review | What Hi-Fi? The truly wireless set of headphones may still be things of wonder, but they are gradually becoming more commonplace. No longer will the wearer of a pair have to endure the stares of strangers on a train, now there’s less chance of being mocked as a character from some low-rent mock-Star Trek TV mini-series. There is a lot to be said for the benefits of the truly wireless technology. Once you’ve experienced the joy of not being physically attached to your phone or laptop, it’s amazing how much reverting to being tethered ticks you off. What’s more, with each new model, and each new iteration, the reliability of the connection and the ease of use get better and better, making truly wireless buds much more of a realistic day-to-day option. And Jabra, with its Elite 65t earburd, has got plenty of boxes ticked as far as practicalities go. The packaging is pleasingly price-appropriate, with a card outer sleeve and a sideways-sliding main box revealing two earpieces nestled in their individual beds of moulded plastic. Also in the box are three sets of tips of varying sizes, a booklet with set-up instructions, the carry case, which doubles as a charging station for the earbuds, and a USB cable used for powering up the case. The earbuds themselves are lightweight (the right-ear comes in at 6.5g, the left, 5.8g) and comfortable. Made from plastic, each has a small protrusion pointing forwards towards your mouth with microphones in for phone calls. The right bud has a central button for call answering, pausing and playing music, and allowing ambient noise in or out; the left has two small buttons for volume and track skip (with a longer press). When not in use, they sit in the neat carry case, charging. There is enough power in one full charge of the earbuds for five hours’ listening, and the case holds power for two recharges – meaning you should be able to get 15 hours of playback from one fully charged set. If your buds run out of juice and you want to use them fairly soon, a quick 15-minute charge gives a claimed 90 minutes of battery life – enough for most commutes home. There is a free app that we would recommend getting onto your device. It features a full manual and various tabs for adjusting settings, such as the amount of ambient noise you want to allow in, and an equalizer, should you wish to fiddle with the sonic signature of the headphones. We stick the largest of the tips on each bud, and find that the Elite 65t units fit securely in our ears without ever feeling insecure (in a week or two of commuting, we often forget we’ve got them in – so the comfort is impressive). Connecting the buds to a phone is simple, the instructions included in the box proving sufficient to lead us – indeed, the earbuds themselves provide most of the instruction we need, once they are in place. Soon we’re up and running and enjoying the remarkable liberation of wire-free listening. 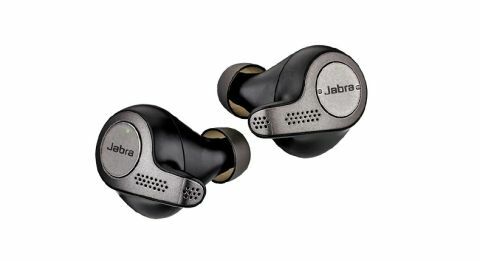 These Jabras work impressively well at connecting to your device without dropout – and, in our experience, the connection between the two earpieces themselves is absolutely solid. They are easy to use, and the practicalities of answering phone calls and so on are dealt with without fuss. Take a bud out, and your music pauses. Put it back in to restart. Double push the right ear bud to pause music and let outside noise in. Adjust volume with the nubbins on the left earbud, and push longer to skip track. It all just works without complaint. Impressive indeed. However, we find do fault with the sound that the Jabra Elite 65ts provide. Listened to in isolation, they are decent at conveying a tune. But something doesn’t feel quite ‘on-song’. We aren’t enthused by the music we’re listening to – there’s no special sense of drama or excitement here. Tonally, music is relayed faithfully, with a slight emphasis, perhaps, on the midrange over the bass and treble – but that’s nothing to be worried about. And, should you be inclined to boost either end of the sonic spectrum, the equalizer can make a noticeable difference in those areas. But no amount of fiddling with the app can bring the passion back into the tunes we’re listening to. It feels a little as though we should best describe the Jabra Elite 65ts as being competent ‘audio’ equipment, rather than true ‘hi-fi’. Nothing stands out as being particularly bad – and perhaps that’s where we can point a finger: there’s no great spark in the presentation, no real dynamism. It’s all there in a non-offensive melange of sound. And that lack of passion is brought to the fore when we compare the Jabras with their closest rivals, Sony’s WF-1000X (£125) and the Bose Soundsport Free (£180). They're both superior across the board, with greater musicality and a much more entertaining style of delivery. The Jabra Elite 65t true-wireless earbuds have a lot going for them, as far as general use, convenience and solid connection go. Their problem lies in a lack of passion and dynamism in their musical presentation that, once they’ve been compared directly with some of their main rivals, is clear and obvious. They will be the ideal commuting companion for many people – but for the audio lover, we’d recommend saving up just a bit more for a superior sonic performance.